The product reports allow you to easily see which of you’re products, categories and courses are selling in value and quantity totals. The reports in the product section are all very easy to create and read, so we won’t spend too much time going over them all. See some examples on this page of product reports. Remember you can change the time period the report is over at the top right hand side of the screen, (day, week or month). Above is a day report for category over food and beverage. You can easily see where most of your revenue is being generated. 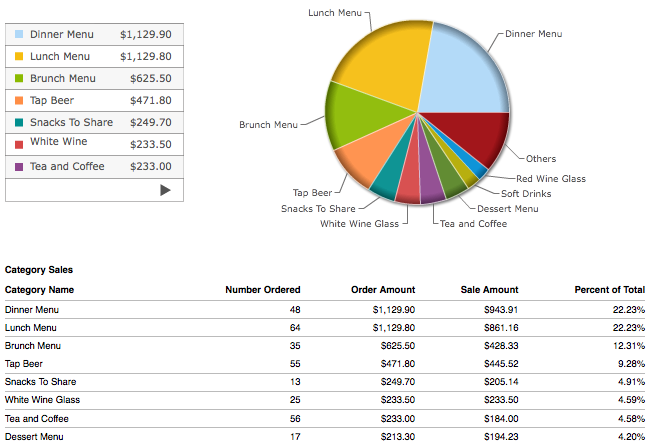 The report above breaks down quantity of each course, and the order and sale value of the each of them. You can see here there are 108 deserts for 525 mains, (just over than 20%), you might give your staff an incentive to get that to 30%, (you can then pull individual desert %’s from the staff reports to see who is putting in the effort and upselling the most).